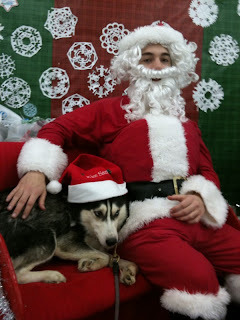 Nukka has come back into foster care due to some health problems she is having. She had not been able to hold her urine during the night, even at 5 months old. 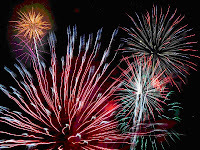 She has been to a few specialists and had an ultrasound, as well as several other tests. The vet found that her urine is too highly concentrated, and recommended putting a water bottle in her crate, and putting canned food in her kibble. 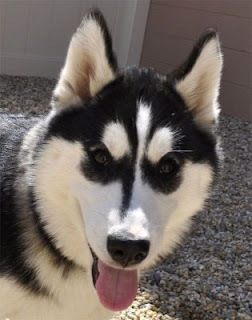 Nukka will be spayed on May 13th and a biopsy of her bowel tissue will be taken for analysis. 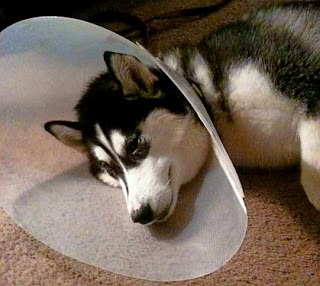 Any donations to help with the cost of Nukka's vet care would be greatly appreciated, and are also tax deductible. Lucy's puppies are being bottle-fed to give Lucy the chance to gain some much-needed weight. Here they are getting their dinner. It's amazing how fast they're growing! 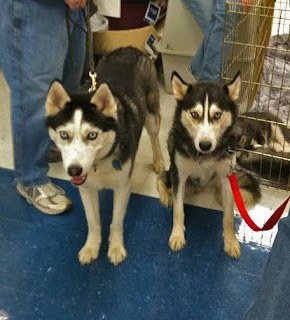 HTH took in two adult Siberians last weekend, a male and female that were rescued from a puppymill. To our surprise, the female was pregnant, and quite far along! 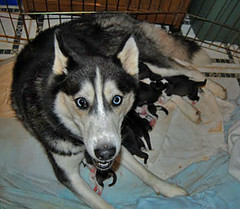 She had the pups last night and today, 7 total. They were all checked by the vet and are doing fine. Lucy is being a great mom, and Desi is a proud daddy. 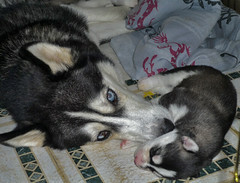 Click on the photo to view photos of mom and pups. Beki was turned into the Baltimore City shelter by her previous owners. They had financial problems and were no longer able to care for her. Becki had been hit by a car last March. She had one surgery and was supposed to have another, but the family could not afford it. She had a noticeable limp in her left rear leg. Becki's foster parents took her to the vet to get her hip x-rayed. 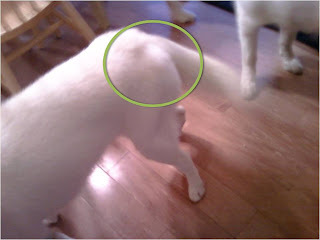 The x-ray showed that during Becki's first surgery, the vet had put a pin in her hip to hold it in place while her hip healed. The pin should have been removed during her second surgery. The pin was actually protruding and digging into her muscle, skin and tissue as she moved, which is why she limped. Her foster parents made the appointment to have the pin removed a few days later, and Becki is feeling much better! The vet gave them the pin as a souvenir. You can see why it was hurting her - that's a BIG pin! 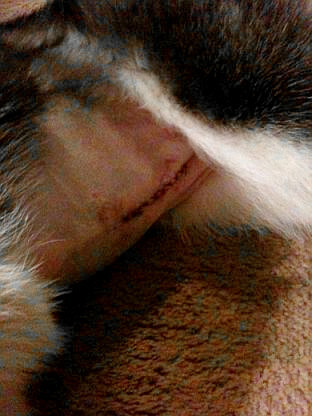 The incision to remove the pin is very small and is healing quickly. Now Becki can move and run like a healthy young pup!